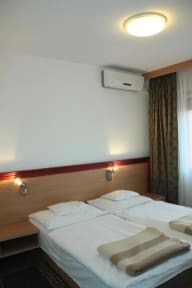 Tisza Sport Hotel lies in the quiet greenbelt of Szeged, where we welcome students and our guests whether in renovated rooms equipped with bathroom, colour TV, radio, refrigerator and balcony, or rooms with shower. The hotel has an atmospheric air-conditioned restaurant, a big green park and terrace connected to the restaurant, sport ground and playground which make the perfect place for gardenparties, youth programs, sport competitions or other open-air programs. Room prices do not include Tourist Tax (2.-Eur / pers. /night).